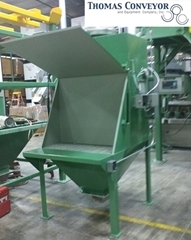 Thomas Conveyor and Equipment manufactures various dust separation systems for dust collecting. Some of our products include. Reverse Pulse Jet Dust Collectors and Cyclone Separators, Silo Bin Vents, Vacuum Receivers, Plastic Pellet Central Vacuum System Blower Pumps, with Explosion Proof Venting. Products include plastic pellet and resin, flour, sugar, starch, gluten, salt, dextrose, meal, tortilla, semolina, hydrated lime, limestone, calcium carbonate, soda ash, and activated carbon black. 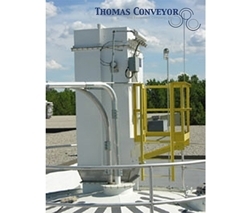 Thomas Conveyor and Equipment manufactures Reverse Pulse Jet Silo Bin Vent Dust Collectors Separators, with Explosion Proof Venting, when required. 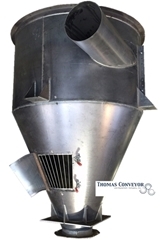 Thomas Conveyor and Equipment provides top quality custom designed bin vent dust collectors for pneumatic conveying sugar, carbon black, starch, dextrose, wheat flour, semolina, silos, and tortilla industries. Our equipment is designed and fabricated in the U.S.A. for your specific needs. Our staff has decades of design and onsite experience to provide the correct dust collector the first time. 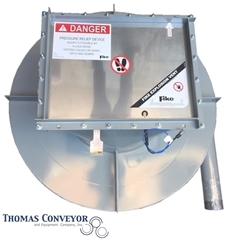 Thomas Conveyor and Equipment manufactures Reverse Pulse Jet Silo Bin Vent Dust Collectors Separators, with Explosion Proof Venting, when required. Our vacuum receivers are either mild steel and primed and painted with (food FDA epoxy) or 304 stainless steel, where we fabricate receivers out of 304l stainless steel with a variety of weld finishes suiting your application, industrial, chemical, paint, fertilizer. Thomas Conveyor and Equipment manufactures Central Vacuum System Blower Pumps for plastic resin and pellets. The pumps are specifically designed to be self cleaning, to rid your operation from manual operator interaction to clean fines out of non self cleaning cartridge filter units. No more banging cartridge filters on the floor to clean. Clean up your vacuum conveying room. Designed for injection molding, blow molding, and extruding operations. Our machine is designed to protect your vacuum blower from fines carryover from filter less vacuum receivers. This skid mounted unit is heavy duty and can stand up the 1000’s of conveying cycles from your pneumatic conveying lines. We can also add a fines collection system to automatically vacuum convey all collected fines from all of your vacuum blower packages to a central collector Gaylord for disposal. Cyclone dust separators are primarily used as course particle size powder, granular bulk product separators. Generally speaking, cyclones can be used as primary particle size classifiers on products such as non dusty plastic pellet. A cyclone decelerates the particle from the air stream using centrifugal force on the interior of the cyclone walls. Product spins down the side walls losing velocity as it travels downward. Thomas Conveyor and Equipment bag dump dust control stations for minor ingredient addition to batch processes.